One of the more interesting events to take place at the Northfield Depot was the brief whistle-stop presidential campaign tour in 1908 of Republican William H. Taft, then secretary of war and Theodore Roosevelt’s hand-picked successor. 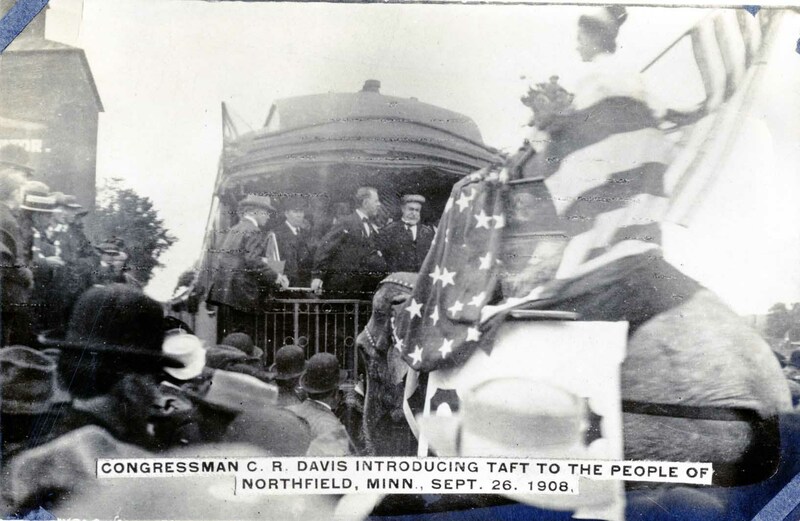 On Saturday, September 26, 1908, Taft was scheduled to leave Faribault between 1 p.m. and 2 p.m. in his private rail car, “Constitution.” Delayed, he arrived in Northfield at 3:30 p.m. People of all ages made their way to the Milwaukee-Rock Island depot, jockeying for a spot. This crowd, estimated between 4,000 and 8,000, represented the single largest gathering along Taft’s campaign route that particular day. With little elbow room, the crowd waited patiently in the noted “nasty cold” weather with overcast skies that eventually turned to rain. St. Olaf College students, representing a recently organized Taft Club and Band, stood under a red, white and blue banner proclaiming “Taft Club,” and they played when the candidate appeared from his coach. Nearby Bridge Square hosted the Patterson Carnival Company with elephant rides, sideshows, souvenir sellers, merry-go-round, and shooting gallery. As Taft arrived, a carnival elephant was slowly being led by the mahout to the back of the coach where the candidate stood. 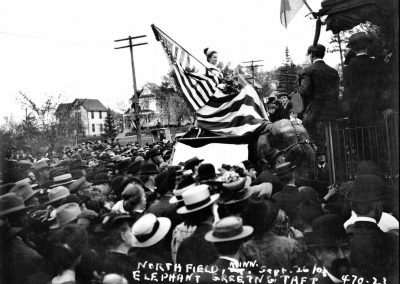 Mildred Ware, the mayor’s teenage daughter, rode the elephant. Dressed as Columbia, she was wrapped in the flag of forty-six stars and waved another flag in her hand. The 51-year-old Taft, who stood nearly 6 feet tall, obviously was poking fun at his weight, estimated at the time to be nearly 300 pounds. 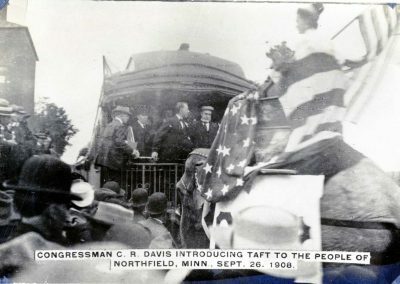 Taft’s Northfield whistle-stop lasted but a few minutes before the train resumed its journey, with Senator Moses E. Clapp in mid-address. St. Olaf College students, representing a recently organized Taft Club and Band, stood under a red, white and blue “Taft Club” banner and played when the candidate emerged from his coach. St. Olaf Yearbook, 1910-1911-1912 annual. 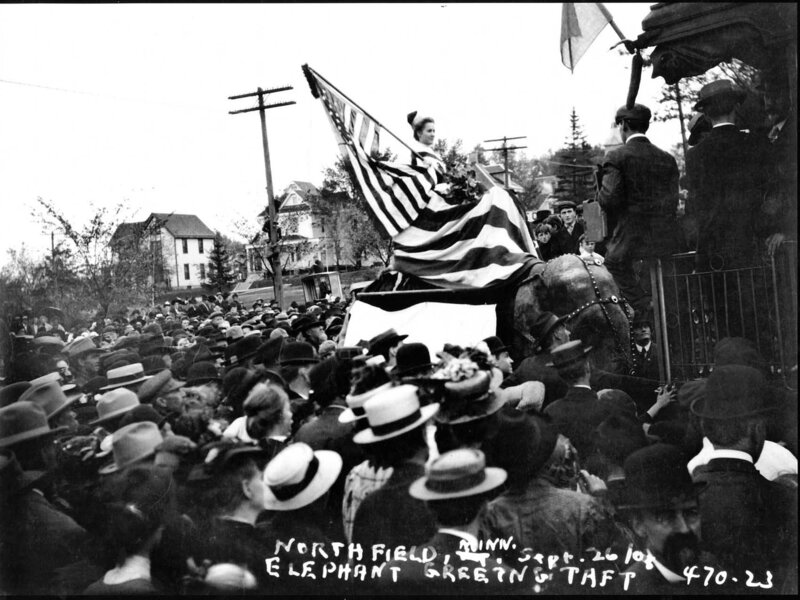 September 26, 1908: Northfield whistle-stop presidential campaign tour of Republican William H. Taft. Nearby Bridge Square hosted the Patterson Carnival Company with elephant rides. As Taft arrived, a carnival elephant was slowly being led by the mahout to the back of the coach where the candidate stood.